The UK's largest car manufacturer, Vauxhall, has admitted its future depends on the US government bailing out its parent company General Motors. During discussions, GM said it needs $4bn (£2.7bn) in emergency funding this month alone if it is to survive. Vauxhall, which employs more than 5,000 people in Luton and Ellesmere Port, Cheshire, said the negotiations were "highly relevant" to the UK. The company has denied reports it asked the UK government for financial aid. General Motors (GM) and other the troubled US car-makers, Ford and Chrysler, have so far faced considerable opposition to their wider plea to the US government for a $34bn (£23bn) rescue plan. GM bought Vauxhall in 1925 and a spokesman for the company said the negotiations in Washington were "highly relevant to the strategic direction of the GM global business and specifically for Vauxhall in the UK". In October, the Vauxhall car plant in Ellesmere Port stopped production for 14 days because of falling sales in Europe. 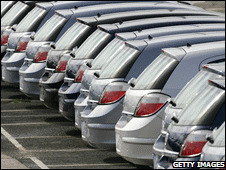 Car sales in the UK have fallen 37% when compared with the same time last year. The Times reported that Vauxhall had sought "financial guarantees" from the government in an attempt to stave off redundancies. The company, along with other British-based car-makers and trade body, the Society of Motor Manufacturers and Traders, met Business Secretary Lord Mandelson on 27 November. However, a spokesman for Vauxhall told the BBC it was "doing quite well" and rubbished suggestions it was in a period of "doom and gloom". He said the company and other vehicle manufacturers had instead "pressed" the government to help consumers obtain the finance they could then spend on cars. The Department for Business, Enterprise and Regulatory Reform (BERR) has confirmed "financial solutions", including bridging loans for the companies were discussed at the meeting. BBC business correspondent Joe Lynam said that before that particular formal gathering, other car manufacturers had made individual representations to Lord Mandelson but BERR has indicated it would not comment on any of these. A spokesman for BERR said: "The government is considering these approaches but no decision has been made." Instead the department planned to take "a pragmatic and hard headed approach in light of the fiscal position as outlined in the pre-Budget report."